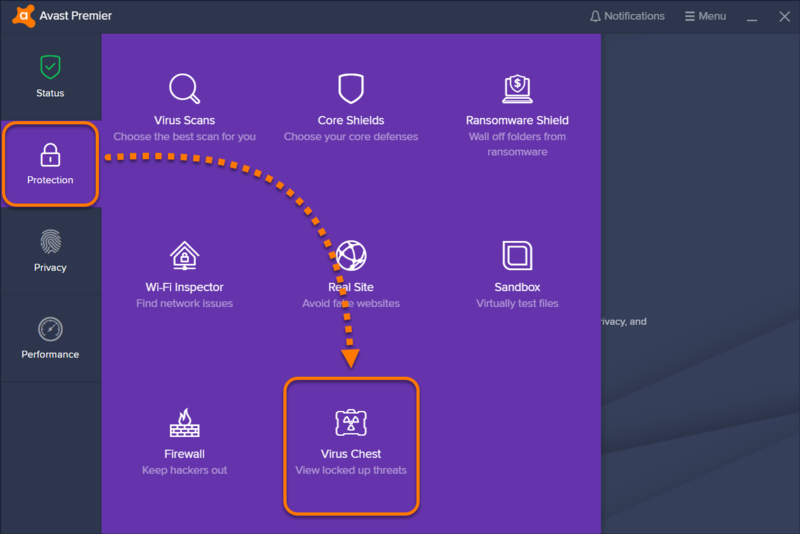 The Virus Chest is a safe place in Avast Antivirus for storing potentially harmful files and completely isolating them from the rest of your operating system. Files inside the Virus Chest cannot be accessed or run by any outside processes, software applications, or viruses. 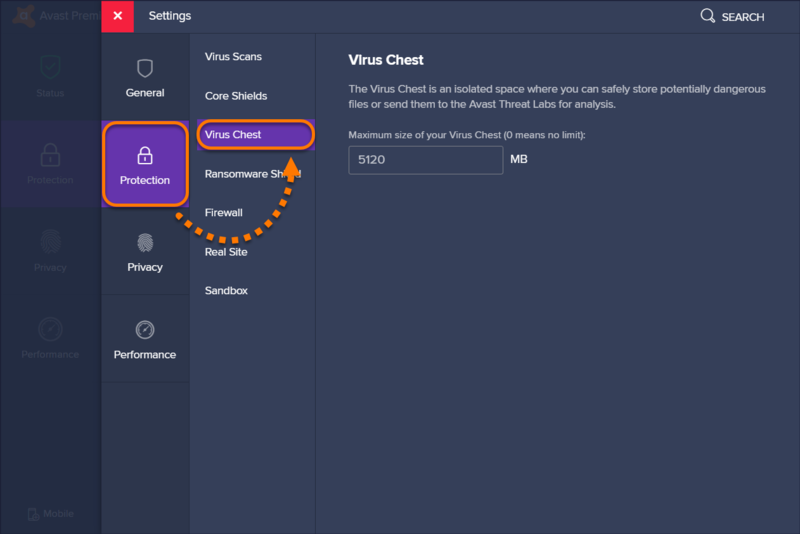 Open the Avast user interface, then go to Protection ▸ Virus Chest. 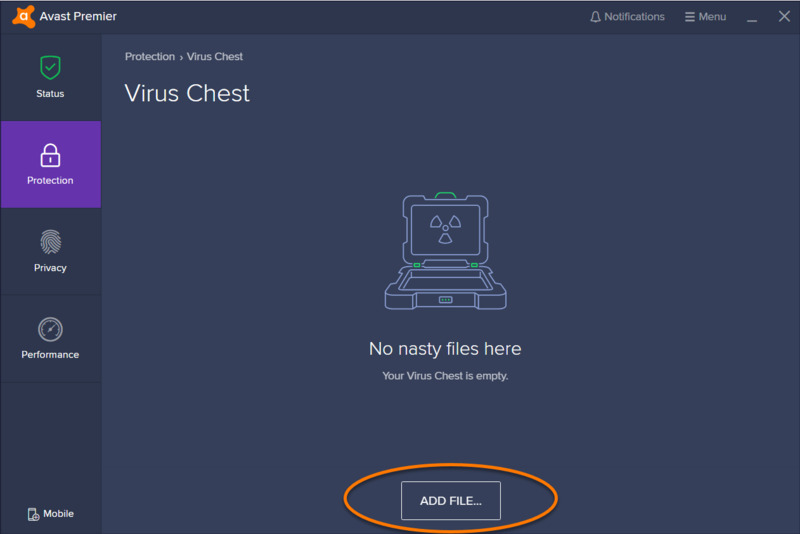 Right-click the Avast icon in your system tray and select Virus Chest. Locate the file you want to move to the Virus Chest ('sample.exe' in the example below) and click Open. The file now appears in the Virus Chest and can be sent for analysis. 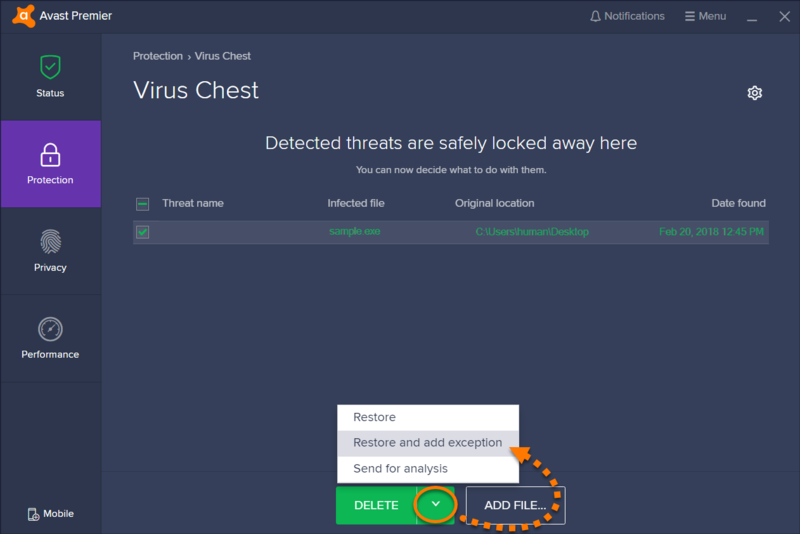 Restoring files from the Virus Chest poses a high security risk. This action requires advanced user knowledge and is only intended for specific situations (for example, if a critical system file is moved to the Virus Chest). This option will restore the file to its original location on your PC. We recommend using this option only if the file is safe from malware. 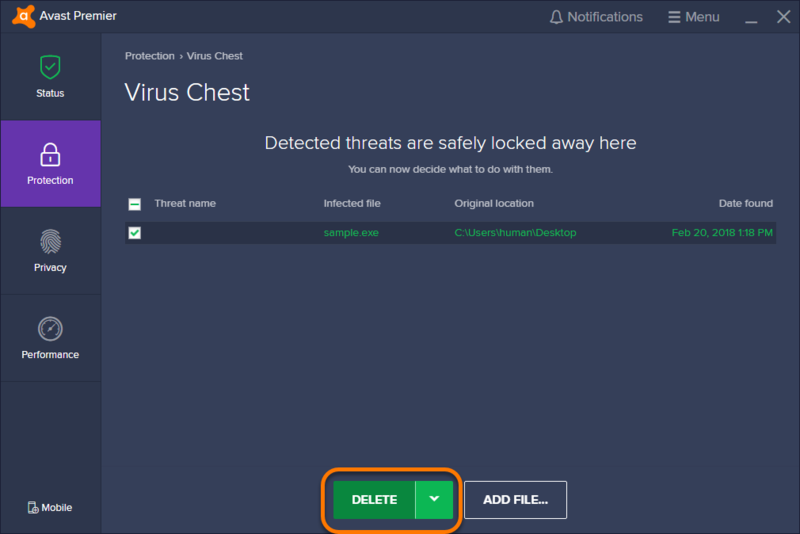 Tick the box next to the relevant file in Virus Chest. Click the down arrow next to the Delete button and select Restore from the context menu. Click Close in the confirmation dialog that appears. This option will restore the file to its original location, and will add an exception to your exceptions list. 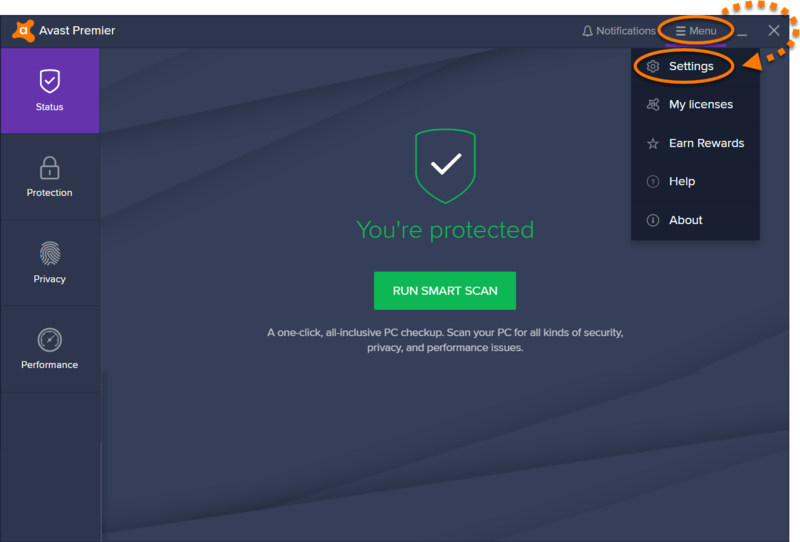 All exceptions in the list are excluded from all Avast scans and shields. Click the down arrow next to the Delete button and select Restore and add exception from the context menu. To check that a restored file is saved as an exception, go to Menu ▸ Settings ▸ General ▸ Exceptions. 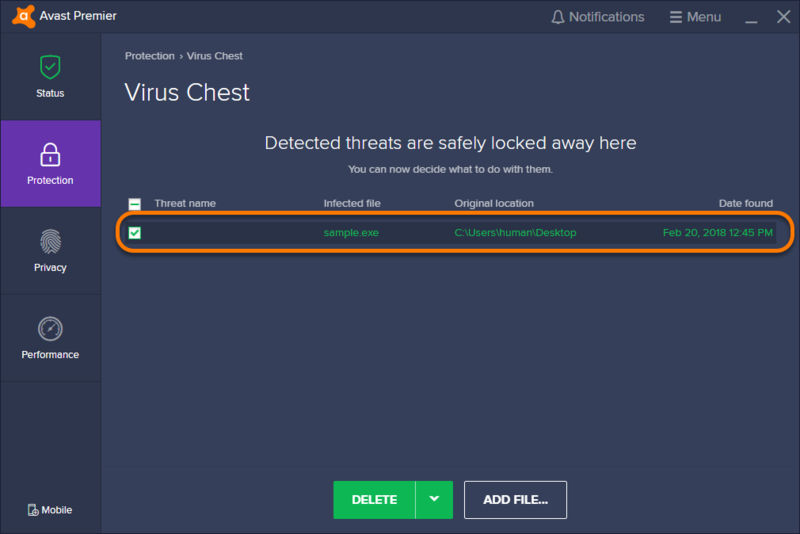 Potential malware: files that Avast has not flagged as malware, but you believe may be malicious. 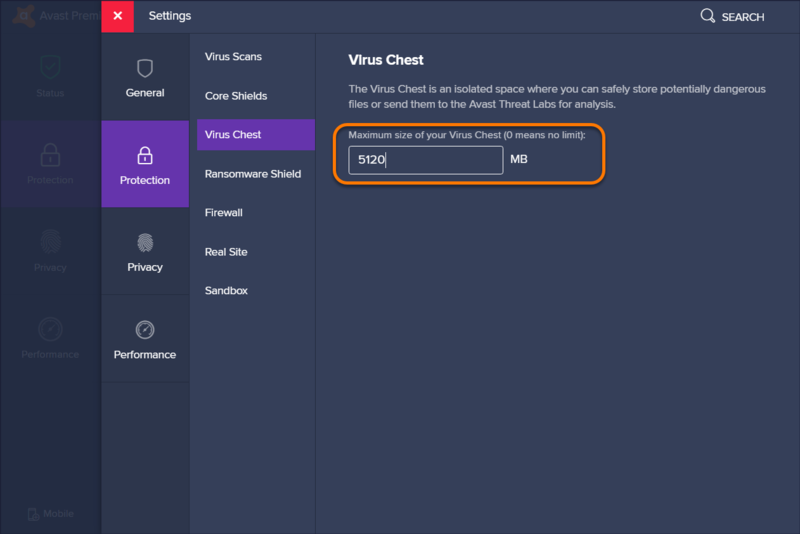 False positive: files that Avast has identified as malware, but you believe may be clean. Click the down arrow next to the Delete button and select Send for analysis from the context menu. In the form that appears, tick the relevant box and provide any details related to your issue, then click Send. This action permanently deletes files from your PC and cannot be undone. 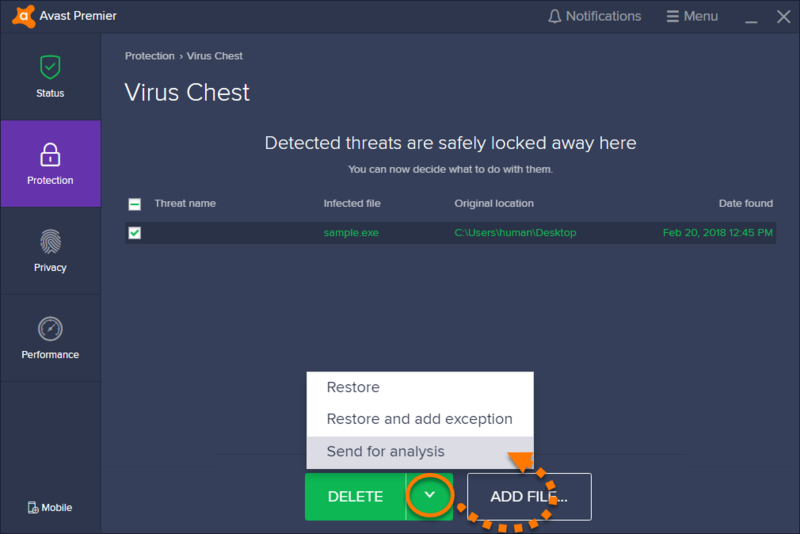 Click the Delete button at the bottom of the Virus Chest screen. Click Delete in the confirmation dialog that appears. Open the Avast user interface. Go to ☰ Menu ▸ Settings. Click Protection ▸ Virus Chest. 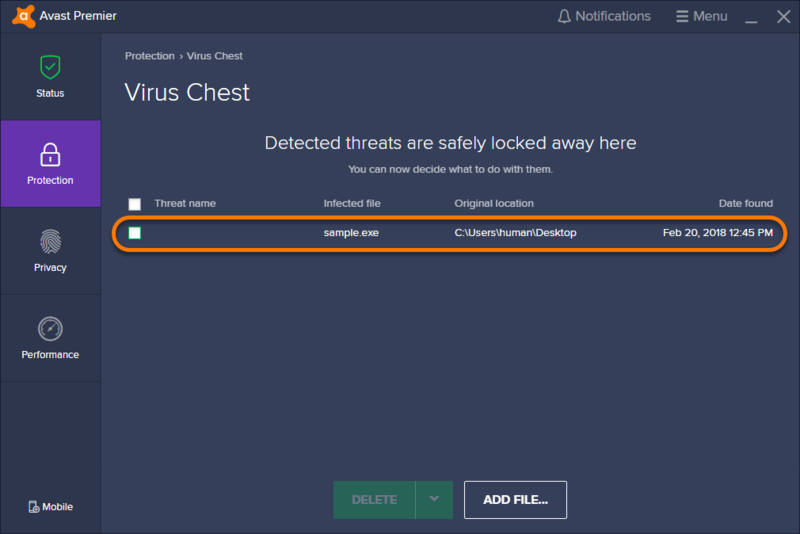 Click into the text box and redefine the maximum size of your Virus Chest. The Virus Chest space allocation is now configured.